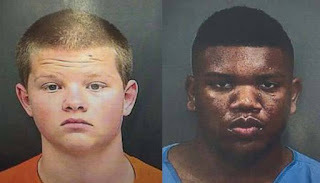 Deputies: Two juvenile detainees use sheet as rope, escape through window | Crime Stoppers of the Lowcountry: 554-1111 | 1-888-CRIME-SC | Anonymous tips earn cash rewards with Crime Stoppers of the Lowcountry. Charleston County sheriff's deputies are searching for two juveniles they say pried a window open and used a sheet as a rope to escape from a detention center in North Charleston. Deputies are looking for Christopher Rawls and Tylique Rhoden, both 16 years old and wanted for armed robbery, after they wound up unaccounted for at the juvenile detention center on Headquarters Road. They were last seen wearing red and white striped jumpsuits. Officials believe the teens climbed over a barbed-wire fence and were picked up in a car after using the sheet to escape the building. The deputies were called to the juvenile detention center Wednesday at 4:17 a.m.
At this time, there is no evidence that Rawls and Rhoden are in possession of weapons, but officials say they're considered dangers to the community because of the nature of their charges. Officials do not know when the teens broke out. Three staff members who worked at the juvenile detention center overnight are likely to be placed on leave with pay as officials investigate the incident, Major Eric Watson with the Charleston County Sheriff's Office said. Anyone with information on their whereabouts should call Charleston County Consolidated Dispatch at 843-743-7200.